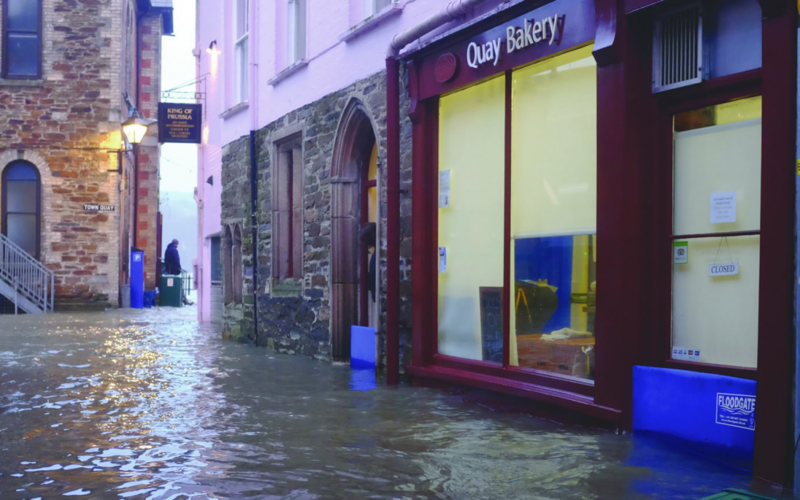 Tom French and his partner Nicola Hanks opened the Quay Bakery on Webb Street, just up from Fowey’s Main Quay in 2012. They have received glowing reviews from customers and critics alike since then and the business had gone from strength to strength. For most of us, the violent storms of the 2013/14 winter were a nightly television spectacle as the national news delivered extraordinary images of the storms impact on the coastline around the UK. For Tom and Nicola and many others in Fowey and along the South Cornish coastline, the reality was right on their doorsteps – literally. Storm after storm pounded the coastline with storm surges compounding the seasonal high tides to send sea water cascading up busy shopping and residential streets in the centres of these normally quaint and picturesque seaside Cornish towns. The Cornish, historically, are no strangers to wild weather but when high tide means the wheelie bins are floating past your windows, it is definitely time to take serious measures to protect your homes and businesses. For Tom and Nicola, their solution was to use the Floodgates that had already been purchased by their landlord and came with the premises when they moved in in 2012. They quickly discovered that they were an invaluable asset, protecting their business and home. Floodgates take only minutes to deploy meaning that, for the rest of the time, when the tide was lower, they could still have unhindered access to their business, only needing to put them in place ahead of the high tide. The picture here was taken by Tom himself, during the final day of flooding – For Tom and Nicola, Valentine’s Day will never be quite the same again. There is an old Scandinavian saying “There’s no such thing as bad weather – just inappropriate clothing.” It would seem that the same concept can be applied to buildings and flood protection.